For little girls who love Ladybug Girl and Fancy Nancy, here’s the perfect story to share on any day you’re filled with love! So begins the day of one young girl who decides to stage a wedding between her stuffed animal, Mr. Mittens, and Pinky—her cat. Pinky is less than thrilled with the idea, even when Superlove dresses up as the flower girl and arranges some practice weddings between her other stuffed animals. Will Superlove get Pinky out of the tree in time to be the blushing bride? Or will she come up with another way to save the day? This is a cute and beautifully illustrated picture book about a little match-maker - a girl who nicknames herself Superlove - who pretends-play in her garden. With her special wand of love she decides who will fall in love today and she works hard to prepare a perfect wedding - with pretty things hanging down from tree branches in the garden, a special path to walk on, lots of guests and a place for the bride and groom to stand. And the little girl is going to be the most perfect flower girl ever. As a kid, I loved pretend-play. Together with friends, we pretend-played grocery store, family, school and, of course, weddings, too. I am very fond of those memories and I think every child loves to pretend-play and make-believe. It teaches them creativity, helps their imagination grow and introduces them to certain concepts. And, of course, it's super fun to play! 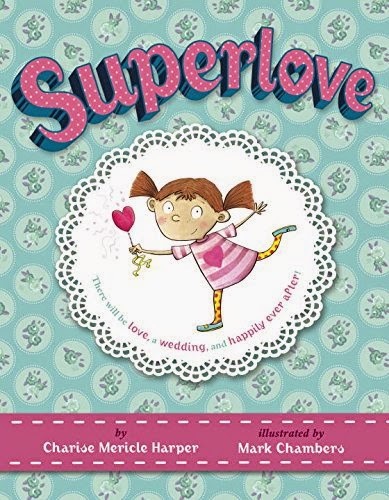 Superlove is a really adorable story that will appeal to many little girls. Girls love dreaming about weddings, pretty things and love - and this book has all that and more! The little girl in this story is really darling and I'm sure kids will love reading about her. The drawings are very detailed, colorful and funny, and reading this book is very entertaining. And Pinky the cat is just a precious, if a little bit reluctant, companion.